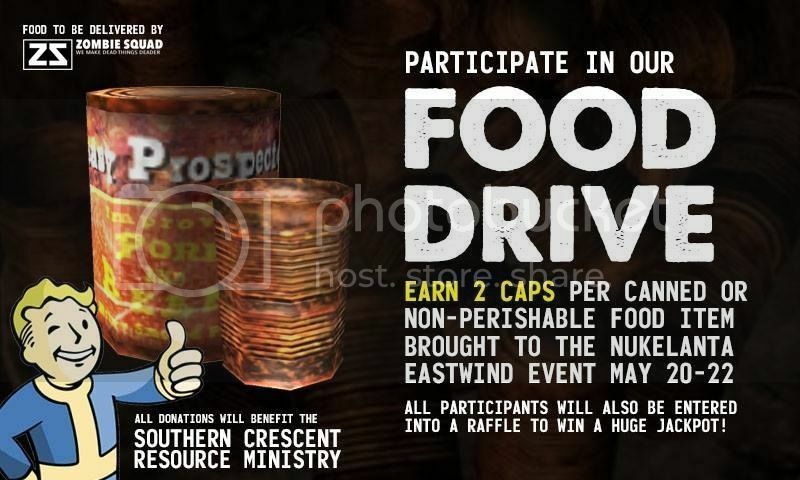 We are putting together a canned food drive at one of the Fallout Nukelanta events. We are collecting cans as players enter to field and give them an in game currency as a reward. The in game currency is bottle caps. What we need is a member to stay at a table at busy times and carry a radio in the down time for someone to contact if a new player arrives with cans. At the end of the event. This event is in Aiken, SC at a LARP castle. We can also table at the event since it is post apocalyptic. This event will be camping overnight, cooking over fire, and much more. If any members are interested in doing this please let me know and I'll work on more details with you. Well, Fallout Nukelanta is all on board. I found us a place in Mcdonough that is happy to work with us. The pantry is something I plan for us to do a few times a year. If anyone is going, let me know. The staff at the event are going to drop the cans at designated locations that I set up and I will be bringing the c ans home myself. If anyone else plans to attend let me know as I could always use the help carrying the stuff for sure. This is out of our zone for the collection point. Is there anyone that will be in the area on those days willing to collect if people have cans but cannot attend the event? The canned food drive went very will. While I haven't counted it out yet, we have probably 100 cans to donate. I plan to drop them off on Thursday. Think you'll have them counted before tonights meeting? When you do turn them in, make sure to keep the receipt or whatever they have for you. We'll need to scan that in and submit it with the event debrief to HQ. Sorry for the late update. The canned food drive gave us 69 cans. Not a bad start for the a drive. We are able to do another in october.